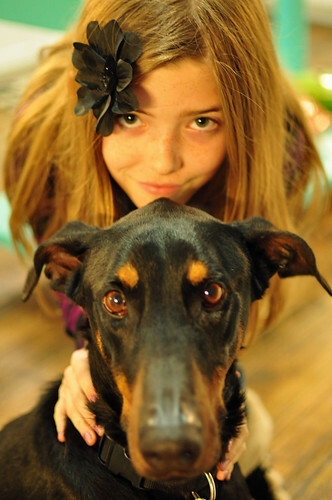 Luc is a super sweet, seven-year-old Doberman who came to live with us last week. He's a gentle guy who loves following us around the house, running and playing at the park, and looking handsome. Luc is extremely well mannered, but he seems a little confused about who is supposed to be walking who when we go out on the leash. He really likes hanging out in the sewing room on the rug, but he's a little bigger than the four and ten pound Yorkies I'm used to stepping over. We're excited to have him with us and I wanted you to meet him. I did a little sewing yesterday. I made a laptop sleeve for my work computer. I'm going on another trip to Milwaukee this weekend and I'm trying to avoid having to check a bag. I can think of a number of things I'd rather spend $50 on than giving it to American Airlines just to transport my suitcase in the belly of the plane. I still use one of those big, black 1990's style briefcases to carry my laptop and all it's stuff. I see cute laptop sleeves all the time for smaller computers, but mine is 17" and the pickings get slim in the larger size, plus this one didn't cost me anything. I'll just toss this and the power cord in my tote and be done with it. I hope it's as functional as it is cute. 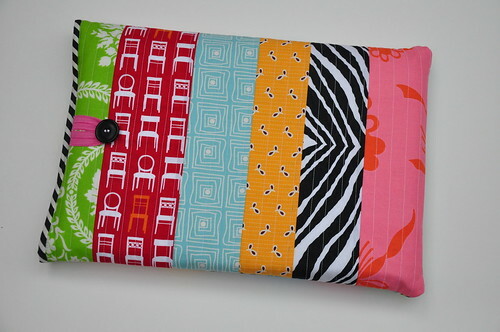 I used one layer of bamboo batting inside and constructed it quilt-as-you-go style. If I made another one, I'd probably use two layers of cotton or bamboo batting or maybe a layer of cotton and a layer of high-loft polyester. The lining is the same black stripe as the binding. The closure is a small length of hot pink FOE (fold-over-elastic) and a button. Now to figure out how to cram five days of Milwaukee wear (that's Texan for clothes for freakishly cold weather) into a carry on. Hmmm. Layers, layers, layers!!! Different colored scarves over the same sweater day after day (bonus if it's a cardigan, so you can add punch under it too)! It's freakishly cold even for us northerners right now, so good luck! you should try using a Gentle Leader. It's NOT a muzzle but it is a leash that goes around the dog's nose and clips right behind their ears. It's great for powerful dogs like labs, goldens, shepherds, and even dobermans. We got it for our black lab and it worked like a charm to discourage her from pulling without resorting to a choke chain or barbed chain. The lap top cover is nice. Love the laptop cover! Will you posting a tutorial on how to make this? 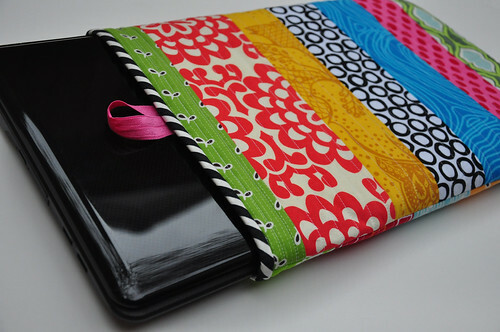 love your colorful laptop case! it's so cheery! Oh my Luc is just gorgeous! We have 2 big doggies at our house (Japanese Akitas) and people generally think we're mad but for us a dog has to be a dog, not a mop on legs as our youngest refers to small pooches!!! Great laptop bag. I had such a hard time finding a bag for my new laptop... even the store I purchased the computer from didn't carry a bag big enough. Maybe someday I'll make a pretty sleeve to replace the plain black neoprene one I ended up with. I love your laptop cover. I have thought about making one for mine too, even though I am not traveling as much. Luc is fabulous!! if he is half as sweet as our Great Dane, you will love him.. And yes, we also have two smaller 17-20 pound dogs around our feet. Milwaukee!!! yikes.. and I agree with above --layer, layer layer.. it does work the best, and easy to remove as you need. Coming to Texas myself from the north, I grew up learning that as a Golden rule !! We haven't checked a bag in years! My sis and bro-inlaw did a month long trip to Africa with carry ons only. You CAN do a week no problem. Make it all match and as someone else said....layers and layers, one pair of shoes (the ones you are wearing), and wear the bulkiest stuff on the plane (you can peel it off once you are seated). Have a great time! Love the computer slip. It looks fab. Have fun in Milwaukee. I've just spent 6 weeks in the country of the state underneath mine doing some full-time work. It was great to live somewhere else for a while and work again. I haven't sewn one stitch the whole time I've been away.... can't wait to get back into it! Love the laptop case! The thick elastic is a great idea for the closure. Thanks for sharing!